Blog from Cachi, Argentina | Around The World In Less Than 80 Days! Leaving Cafayate was hard, firstly because we liked the place so much, but also because the road from there to the next stop on our route was unpaved and 160km long! The destination was Cachi, a small village at the feet of the highest peaks of the Andes. The long unpaved road proved tiring but rewarded us with some unique sights of little villages cut away from the world. The scenery was still very dry and dusty with a lot of sand around, which sometimes made the road tricky to ride on. The largest village we encountered was called Molino, which is where we stopped for lunch. These places seem very detached from modern society at first but on second look they have all one would need. Most of the shops and places to eat seem to have come out straight from the italian 60's.During our lunch in a small local restaurant we started chatting to an old man who was chewing coca leaves. This is quite common practice around the Andes and is apparently good against altitude sickness. We could not miss out and got a little bag for ourselves which we started chewing as we rode off towards our destination. On the way we met a group of guys on transalps which were riding to Cachi on an itinerary similar to ours. We joined the group and arrive in Cachi in marching glory! We got chatting with the friendly riders and in the evening shared a filling picada and lovely meal with the three caballeros. 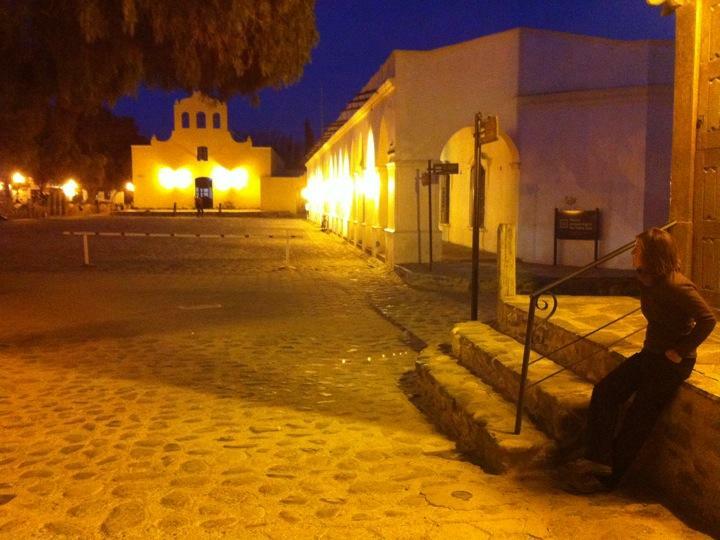 Cachi is a very pretty colonial village, smaller than Cafayate but with a character of its own. The narrow cobbled streets are surrounded by identical white adobe buildings all connected to one another, which lead to the town's main square. The square showcases a very basic yet pretty white church in a style similar of that of the other buildings in town. The perfect setting for picada and sitting outside sipping Salta beer. The next morning we parted ways with Pablo, Pablo and Hector as they headed north via San Antonio de Los Cobres, while we rode straight to Salta.The route took us through some stunning mountain landscapes via deserted straight roads which were also quite a sight! We reached San Rafael chapel on the impressive mountain pass at 3450mt, an inspiring place where the tiny chapel reigns over the surrounding mountains. The road down to Salta was a highlight! Alternating Tarmac and gravel cut trough steep mountain sides spiralling downwards with tight turns and offering different jaw-dropping views with every change of direction. We entered Salta tired but very satisfied of the journey, looking forward to the next section which would take us past Jujuy via the stunning "cornicia"!